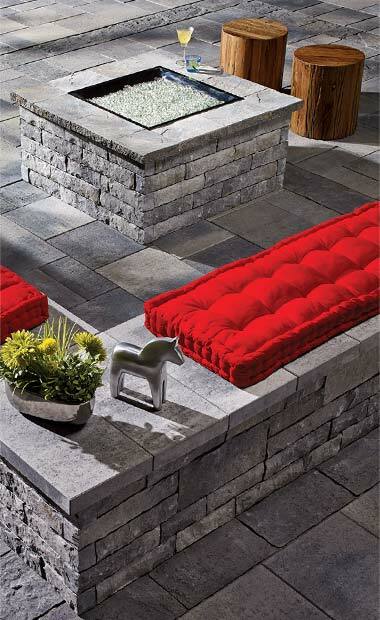 Outdoor living is an increasingly popular trend. Extend your home beyond its four walls with Tandem system products and shape your space to enhance your wellbeing and increase your comfort levels. 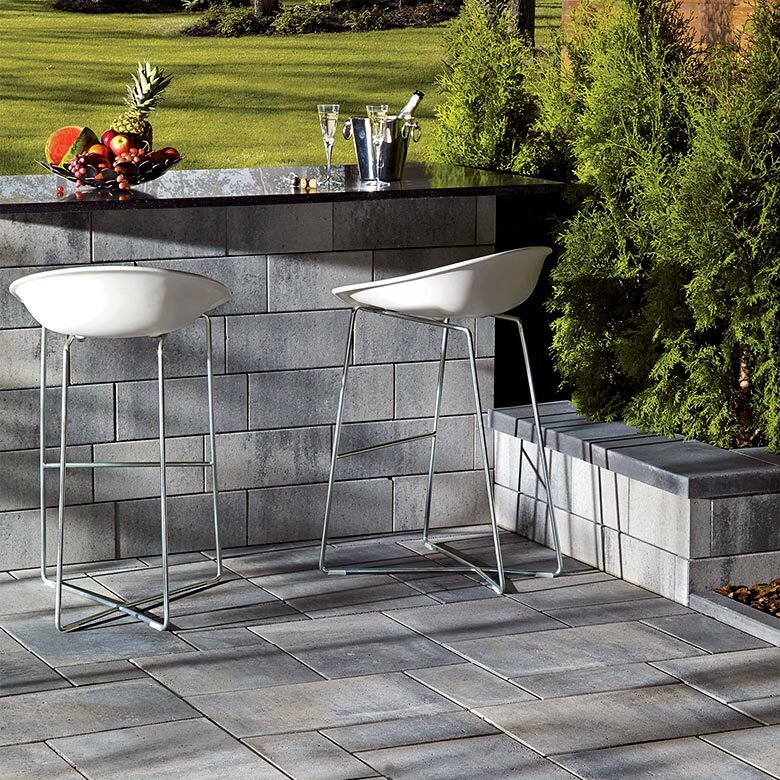 Our smart solutions allow you to divide your space into distinctive areas so you can enjoy beautiful weather to the fullest. 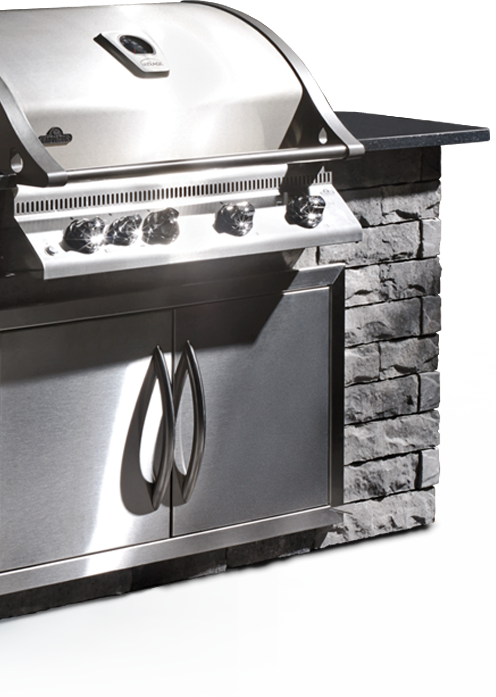 An outdoor kitchen that’s user-friendly and efficient. Meet your new, welcoming space where you can prepare your favourite meals. 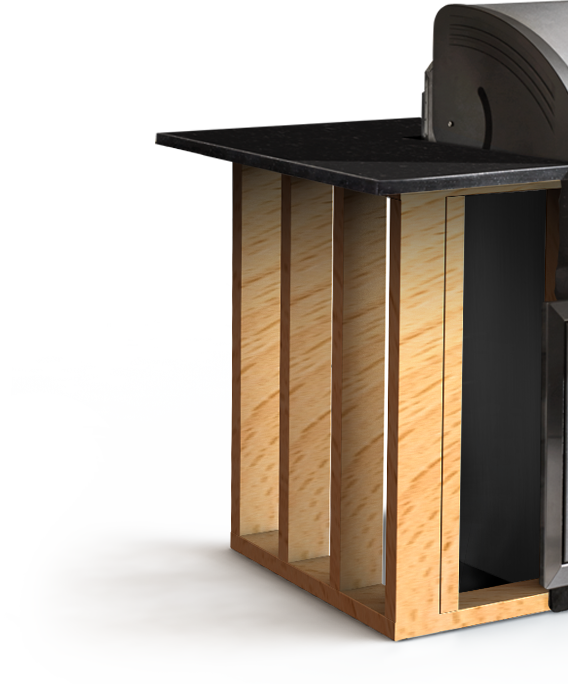 A fireplace that matches your existing setup perfectly. Now you can enjoy more of those wonderful starry nights. A long-lasting and easy to clean outdoor surface. Ideal for sharing family meals or summertime snacks with friends. 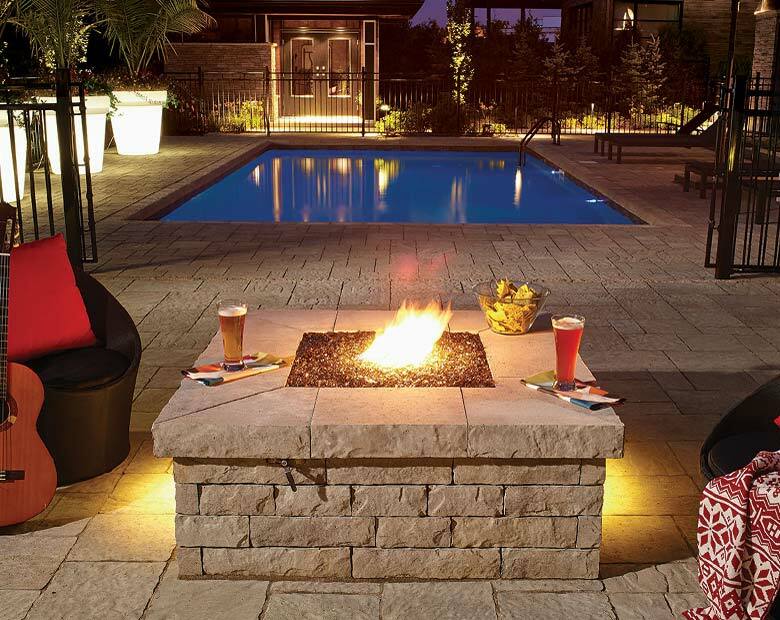 Permacon’s exclusive Tandem® system features versatile products that maximize your property’s landscaping potential to create an esthetically seamless space that’s easy to maintain and looks great. Let your imagination run wild! 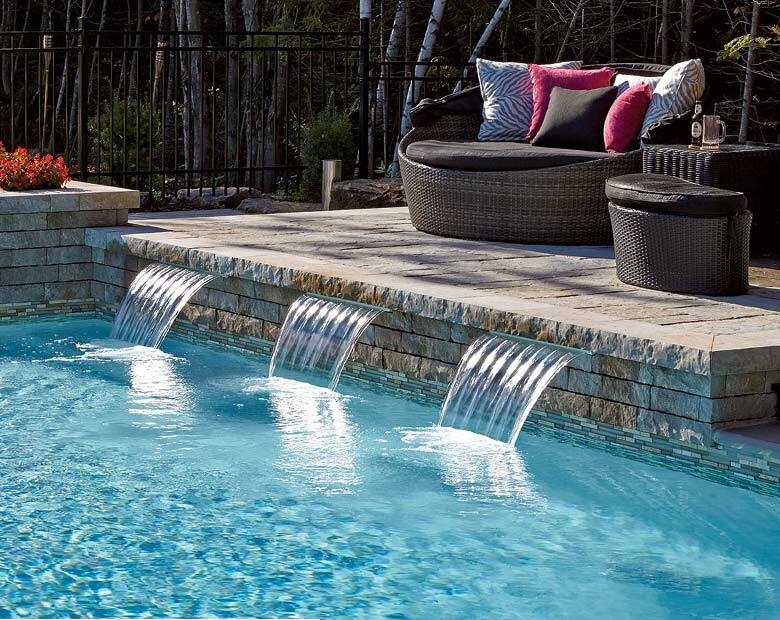 Using the Tandem® system, you can create beautiful waterfalls that drown out unwanted noise, and enjoy the visual cachet of natural stone. Tandem’s unique modular system allows you to perfectly complement your landscaping with backyard furniture of the dimensions you want. 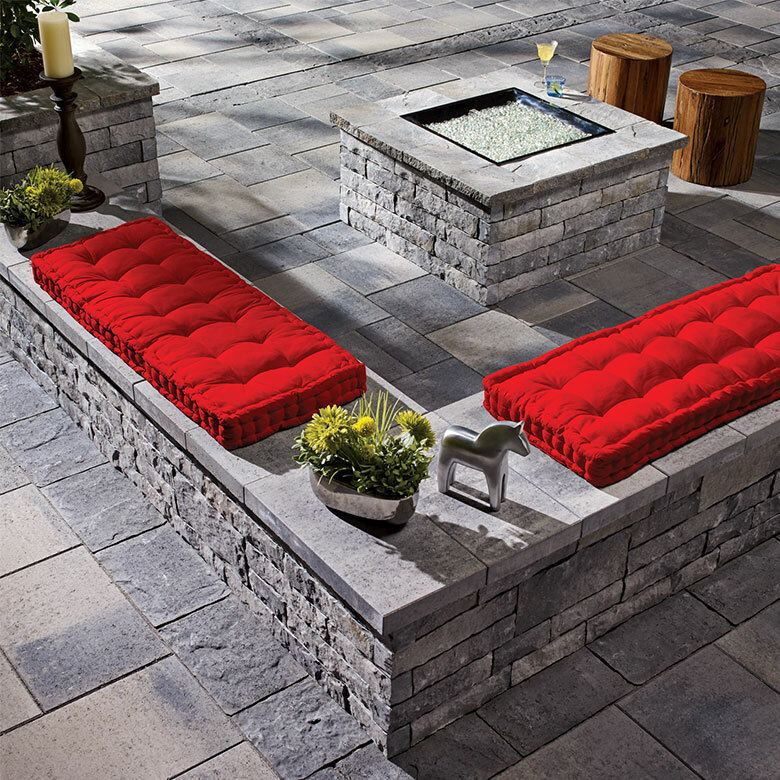 Available in three different textures and five vibrant colours, this imitation stone wall improves the appearance of your outdoor living space. 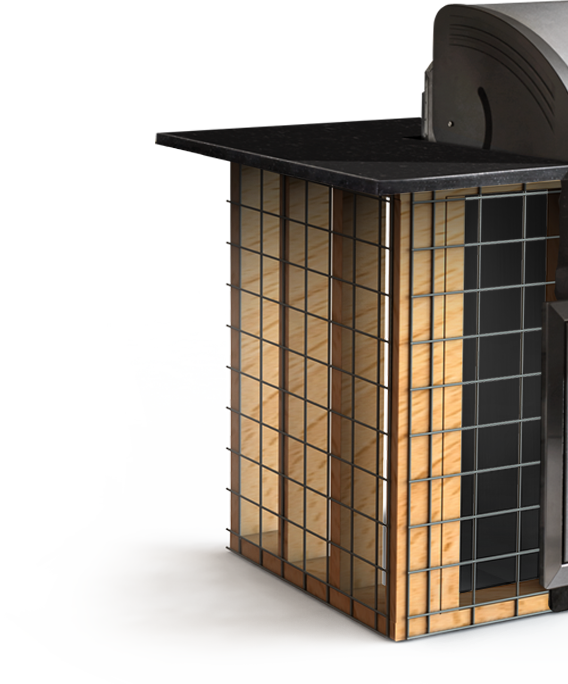 Building an outdoor kitchen is easy with the Tandem® system, as there’s no need for any cementitious materials. Design eye-catching planters and flower boxes with the Tandem® system, and add colour to your outdoor living space. 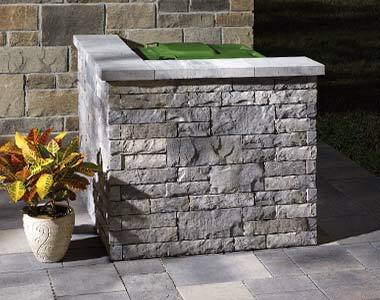 Maintain your privacy with a wall, or position it to hide eyesores such as recycling bins and heat pumps. 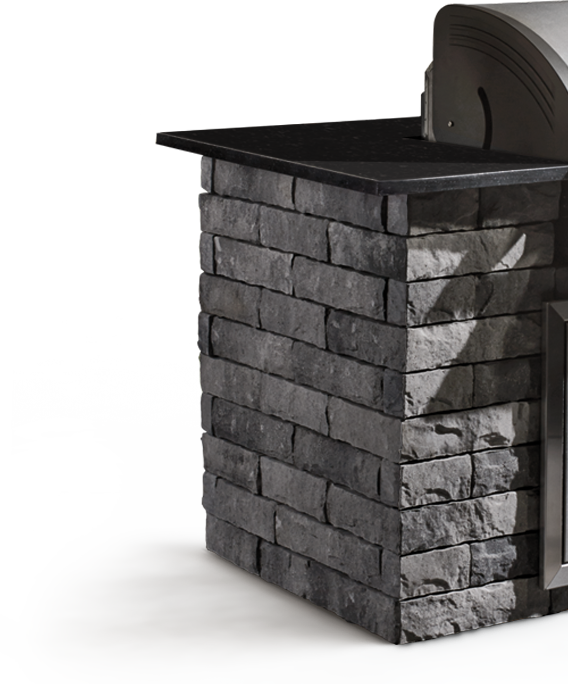 Integrating an outdoor gas fireplace to your landscaping is now possible, and allows you to enjoy cooler late-season evenings. An attractive, easy-upkeep solution to improve your patio’s appearance while blending in with your home's paving, slabs and stone or brick cladding. What makes the Tandem® system revolutionary is its modular grid, which enables a stone veneer to be fixed onto a wooden framework and multiplies the number of potential applications for increased versatility and flexibility. And it’s all done in three simple construction steps. The wooden framework is first built to the desired size, forming a skeleton around which the rest of the structure will be assembled. The modular grid is then attached to the wooden framework, providing an anchor for the Tandem veneer. The veneer units you have chosen are then fixed to the grid using the specially designed connectors. 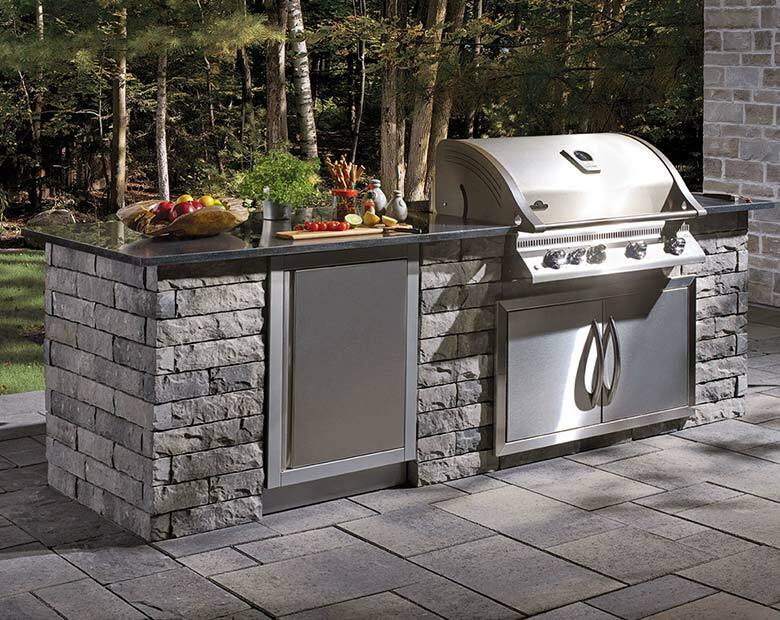 Our Tandem system collections allow you to easily and seamlessly integrate any structure you decide to build, whether it’s an outdoor kitchen, fireplace, retaining wall, steps, slabs or paving. Why choose from a collection? What you build will be guaranteed to match! 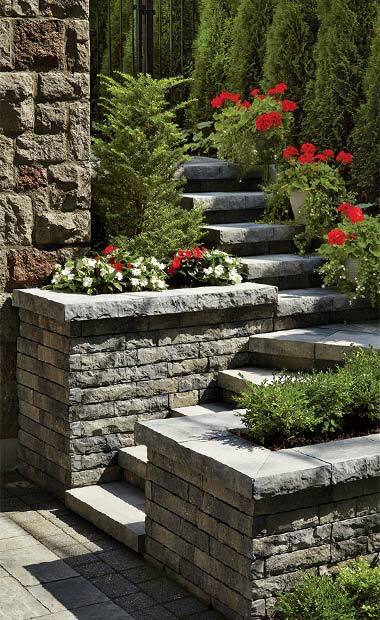 The smooth surface of this wall makes it the perfect complement to contemporary and refined landscaping. The 90 mm and 180 mm veneer units create a sophisticated linear or modular aspect, elegantly completed by long and narrow coping and steps. 3 9/16" × 2 5/8" × 7 7/8"
3 9/16" × 2 5/8" × 10 1/2"
3 9/16" × 2 5/8" × 13 3/16"
3 9/16" × 2 5/8" × 15 13/16"
7 1/16" × 2 5/8" × 13 3/16"
7 1/16" × 2 5/8" × 15 13/16"
7 1/16" × 2 5/8" × 18 1/2"
Available in four rich and vibrant colours, these products will help unleash your imagination. Their variable height allows all kinds of installations — linear or modular — while their chiselled surface, identical to the popular Lafitt masonry stone, evokes a natural look. 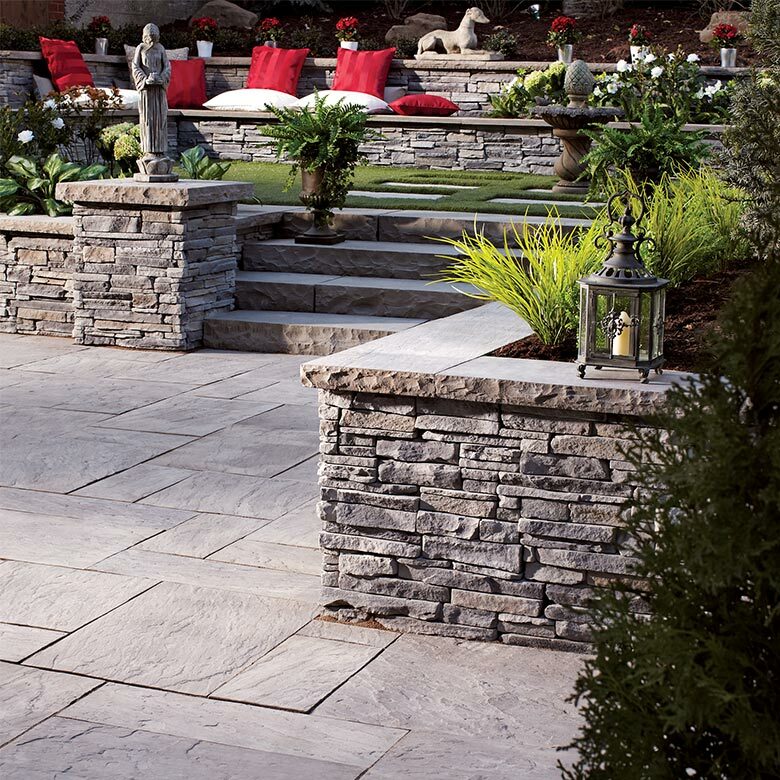 Give your landscaping an antique and highly desired style. 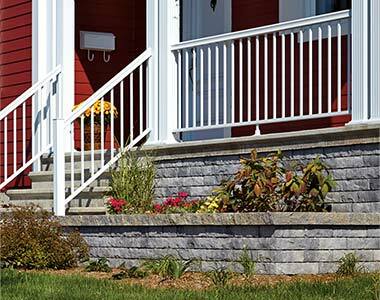 The stacked-stones appearance of the Esplanade wall blends perfectly with all Permacon’s products with its range of vivid colours. 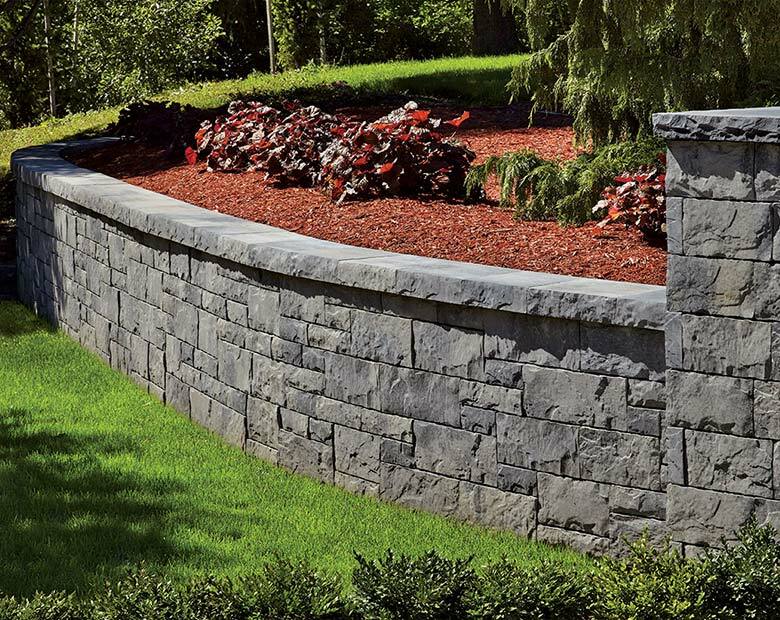 It can be used for retaining walls, double-sided walls and columns. 7 1/16" × 2 3/8" × 13 3/4"
7 1/16" × 2 3/8" × 19 1/2"
7 1/16" × 2 3/8" × 22 1/8"
To complete your project from planning to construction, use an experienced landscape contractor. ©2019 Permacon. ALL RIGHTS RESERVED.